SUBHEAD: Large areas of oceans contaminated by plutonium. Build-up in biosphere a considerable hazard to humans. 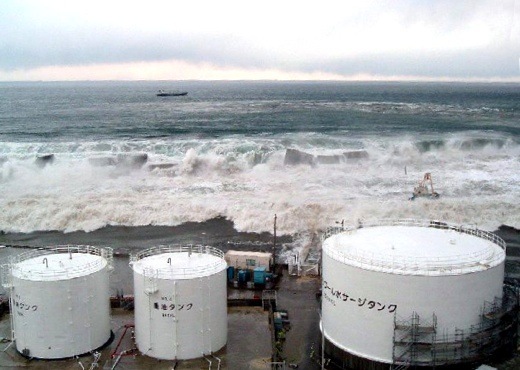 Image above: Tsunami wave generated by the Tohoku Earthquake on 3/11/11 overwhelms and crumbles defensive seawall at Fukushima Daiichi Nuclear Power Plant in Japan. From (http://www.theguardian.com/world/gallery/2011/may/20/japan-earthquake-and-tsunami-japan). Plutonium isotopes 239Pu, 240Pu and 242Pu are anthropogenic radionuclides emitted into the environment by nuclear activities. Plutonium is accumulated in the human body and hence, poses a considerable hazard to human health. Due to the long half-lives, these isotopes are present in the biosphere on large time scales and a build-up can be expected. This characterisation is an international obligation during the decommissioning phase, according to IAEA safeguards. Japanese researchers are now developing and optimizing the methodology to quantify special nuclear materials in particle-like debris of the molten reactor fuel. The continuing nightmare of th core melt-thoughs at Fukushima Daiichi will go on past your lifetime. Looking into a bit of background about the Fukushima Daiichi Nuclear Power Plant disaster. West Coast and Hawaii were hit by radioactive plumes of uranium/plutonium from Fukushima. Education ministry survey states obesity a growing problem among children in Fukushima. Ea O Ka Aina: USS Ronald Reagan & Fukushima 12/15/13 USS Reagan was close to the meltdowns. Sailors and even their children have been seriously injured. Plants outside the exclusion zone are getting of chronic radiation that the Japanese choose to ignore. How did it Affect Kauai? What Debris Came to Kauai? Was anything radioactive? Please step out of the vehicle!